This article is dedicated to all the people who make a decent income, but struggle to save. I will break down the simple 3 components of saving, as well as practical tips you can take action on today. Saving money is very much like weight loss, because it involves the same three things: knowledge, tools, and motivation. How weight loss works: You first need to understand the importance of taking in fewer calories than you expense on a daily basis. Then you need the tools to help you do that. It could be access to a gym, or running in a park. Lastly, you need motivation. We all know someone who made a New Year's resolution, purchased a gym membership, but did NOT go to the gym. 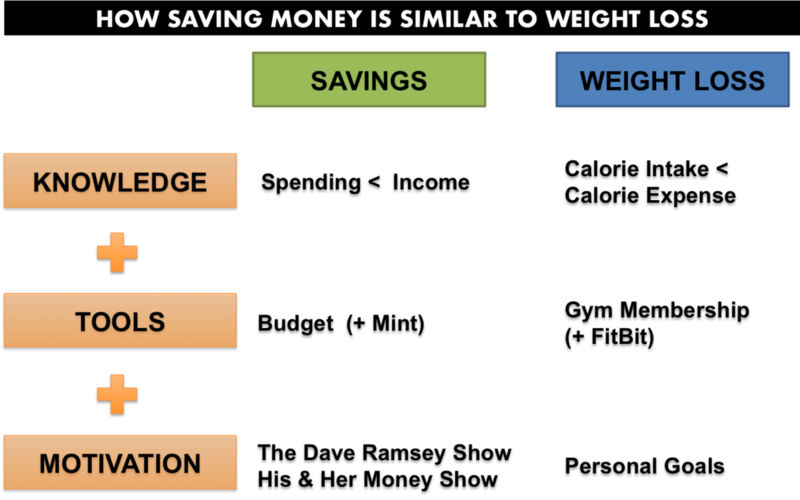 How saving works: Saving money works the same way. Most of us understand that we should spend less than what we bring in. That's it. Simple as that. In terms of the tools, you need a budget. Just like we need motivation to consistently go to the gym, we also need daily motivation to keep our spending in check. In order to save, you need to spend less than what you actually take home, NOT pre-take pay. There's no creative accounting here. It doesn't matter how much your contractual pre-tax salary is, because you don't get to keep all of it. The single most important tool is a budget. In my opinion, a budget needs to be reviewed at least once a month. I have built a custom budget tool (link below). It should be self-explanatory. If you need help, there are detailed instructions in Ep.10 How do I Budget. In addition to a budget, you also need an unbiased way to track your money. Think about something akin to the Fitbit in the workout world. The best free money tracking tool on the market is Mint. It's a personal finance tracker that connects all of your bank accounts, retirement accounts, mortgage accounts in one place, so you can track all your income and spending without doing any work. It's available for free as a website and as an app. Again, just think about it as the Fitbit of the personal finance world. Create a Mint account (either on your computer or app). Connect all of your bank accounts, retirement accounts, and mortgage accounts. Click on All Trends, and then Net Income. Ideally you should be positive every month. If not, then you are living above your means. Click on All Trends - Spending - Last 6 months. You should use the monthly average for each category (such as gasoline) as a reference to enter into the budget tool. Talking is cheap. You won't lose weight by simply "understanding" how it works, and owning a gym membership. Similarly, you can't save by simply "understanding" personal finance, and having a budget. The best way to keep yourself motivated is to listen to real stories about how others have done it. Personally, I listen to two Podcasts from the Dave Ramsey Show, and His & Her Money, during my commute in L.A. These two podcasts are motivational because you hear hundreds of real stories, not hypothetical theories. Typically, these two podcasts feature real people who have gone through financial struggles with car debt, student loans, savings, mortgages, etc. You often hear how people manage to get out of debt, but you also get advice for people who are currently struggling financially. It makes it relatable on a personal level.